fresh local food and a mini marathon! Sandy Balls Farmers Market was quite an experience today! A really great venue for local New Forest food with the added bonus of a mini running and cycling marathon, going on as well. Sooooooo... much lycra, and cheese and veggies too! 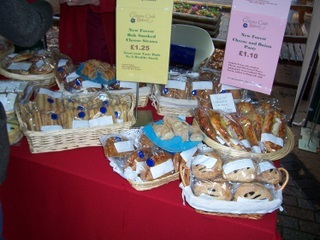 The Sandy Balls Holiday Centre used the piazza area for the autumn farmers market. The weather was typically October; it rained off and on but it didn't put the competitors off the Duathlon run by Race New Forest or us from buying lots of lovely fresh New Forest food. 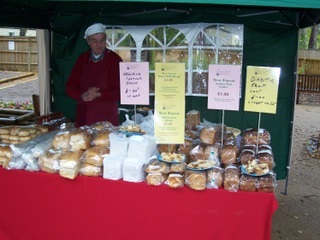 One of the first stalls I saw belonged to Graham and Faye Cotton. 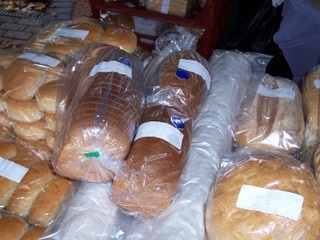 They run Cottons Craft Bakery, which use unique recipes and a variety of mostly locally sourced ingredients to produce a vast range of tempting food. They use New Forest cheese in their savoury foods, and grain from Cadland Manor which is milled at Eling Mill - how's that for a good local food? 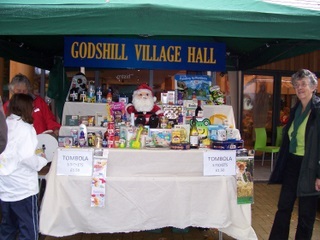 Godshill Village Hall had a lovely stall at the Sandy Balls Farmers Market which had a tombola. It was beautifully laid out with Monica Collins, Anne Dobson and Kate Charman, committee members, helping to raise funds for the kitchen refurbishment at Godshill Village Hall. Village halls play a vital role in the life of our New Forest villages. My local one is used virtually non stop, and often cannot be booked unless well in advance. What about all this lycra? 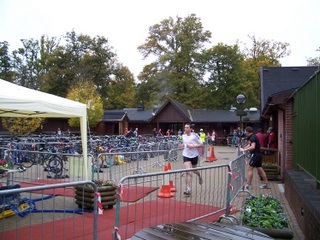 The Race New Forest Duathlon which was taking part was a Run-Bike-Run event over 5K-20K-5KM. They hold duathlons and triathlons throughout the year in the New Forest and I saw a really gruelling one on Sunday 12th July 2009. It was called The Forestman Triathlon and is a Swim-Cycle-Run. At first I thought I'd got the distances wrong, but no, it's 4km-180km-42.2km! How fit are these competitors? I think I'll stick to reviewing food at Farmers Markets and let these real sportmen/women make me feel ashamed! Good luck to them all. Race New Forest has a really beautiful website for more details of the marathons and other future events. Congratulations to everyone today who passed the finishing line (and who made it look very easy!) I hope everyone was pleased with their times and well done from a spectator!